Reshan Fernando started his career at the age of 13. He has an inclination towards all art forms and thus chose to become a filmmaker. Read on to know more about him. I came into this industry as an actor when I was 13-years-old. That happened accidentally. But I always love watching films, listening to music, dancing, like all the artistic stuff from a very young age. I acted in Teledrama (Tv Show), Documentary film, music video, stage drama, stage shows etc And also I worked in the kid’s radio station as a presenter. After I got my diploma of television and filmmaking, I made Dream in 2009, a short film for which I got the highest marks in the institute and I received a diploma. Then I made the short film May 20th in 2009. My father was the producer and my mom also worked on the production. We got well known, popular and very talented actors and we introduced a new child actor. Upon its completion, we sent it to different festivals around the world, and we got an official selection form the International Hollywood Student Film Festival (USA) in 2009 with a screening at Beverly Garland’s theater in Beverly Hills. With that, I got so much opportunities to work or study. I chose a study and moved to Paris to get my International Degree of Filmmaking. 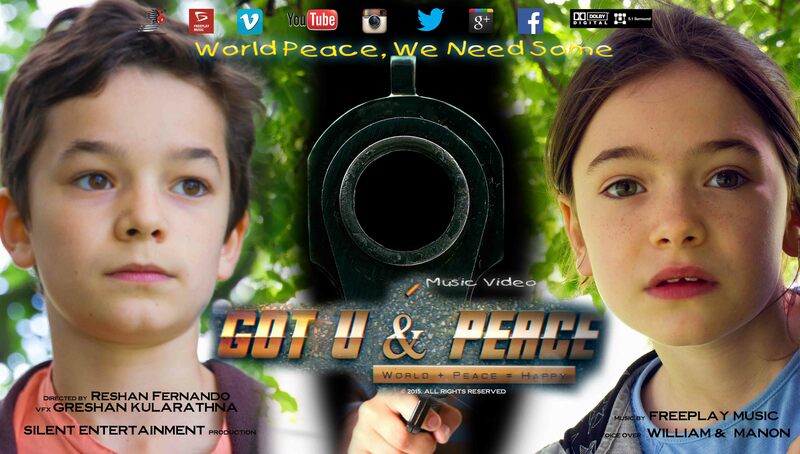 After I started my production company back in Paris I did “Gloomy Boy” & “Got U & Peace” Music videos recently. Got Two official selection awards from the USA for “Gloomy Boy” and happily “Got U & Peace” music video participating few different awards ceremonies around the world these days. I think my family background. Because of my mom, dad & my one and only older brother. We are big fans of films, music & all the artistic things. Our Parents taught us how to entertain the Art. I think that was the big thing. Now I am enjoying by doing it and my bro enjoying it by staying behind it. I have different people work for me & my company. Also my family. But I have a few best friends who are working all the time. I should mention, Ama Abeyweera, Greshan Kularathna & Chamindu Fernando. Also, there are so many other people who are helping me a lot. I did 4 short films & 2 music video on my own. I directed another 3 music videos for different artists through my Production company as well as and more than 10 commercials for different companies and organizations. I wanna do a feature film soon. That is my big dream of doing a blockbuster movie. And doing meaningful, cinema which can entertain a lot. I want to create something memorable for people. Expenses are the biggest difficulty that I’m facing. That’s why I want to show my skills somehow by doing my own project with my own expense and then try to find producers to do something bigger. The magic of cinema! It’s so amazing by doing cinema and entertaining people. And so many things you can give to many people around the world. When I get feedback from the audience, I feel so happy no matter what. I feel like I am born to do this. Many, but I want to tell a real good incident which happened with my “Gloomy Boy” music video. It came out a very serious and dangerous incident in a fake face, and then we found the truth, which it turn all the way around and came to the real face out of it in a very funny way. One stupid lady made a few stories about me and the boy & the girl of the music video and also with the family of them. Then we found out who is she & why she did that because she just wants to tell the world and get some attention by saying she knows me and the actors, their families of this music video. So it was so funny. What advice you’d like to give to someone who is an interested/newbie in filmmaking? Well, my advice is just to think two times & do what you want to do. Try to study and improve what you like & please don’t care about what other people say. Just do what is best for you and surely it will turn out best for the world. Thank you, everybody,, who was there for me all the time. My family, my friends & my lovely audience. Please pass your feedback. Just tell what do you think & how do you feel about my creations. It will help me to bring something better next time. Thanks to you for this amazing interview. Thank you so much.